We have earlier reviewed few free hosting services for WordPress and other scripts like Joomla ,Drupal etc .But free hosting services often faces outages than payed shred hosting . And also its difficult to install scripts on free web hosting as they don’t provide auto installer for scripts .Dreamhost one of the most popular shared hosting provider on net . Their major advantage is the easy to use control panel ,from which even a novice user can install softwares like WordPress , phpBB , Joomla Drupal etc . Dreamhost Apps is new initiative from Dreamhost providing the same shared hosting to a limited number of customers . Currently the program is in invited mode , so here I am providing few invitation codes for those who are interested to join . Sign up with Dreamhost apps . Login to your control panel and select add a domain . There are to options : If you already have a domain , you can point it Dreamhost servers . Else a new domain can be registered through Dreamhost for 9.95 $ per year . Now click on Your apps and select to install an app . 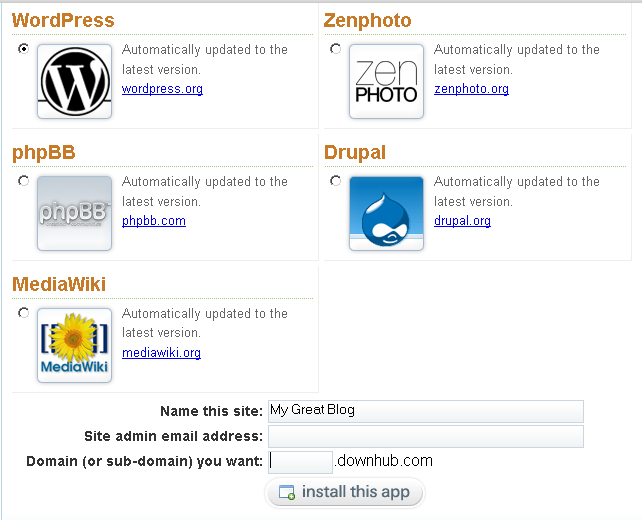 Currently there are WordPress , phpBB , MediaWiki ,Zenphoto and Drupal. Select required App ,choose destination and install . Use any of the two invitation codes to start a free web hosting account at Dreamhost apps . A payed hosting is always better than free hosting . If you can get 70 $ reduction , then why not try these Dreamhost promo codes and purchase original Dreamhost shared hosting ?